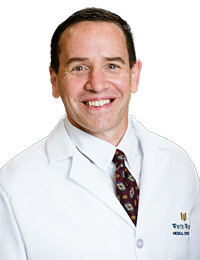 Kyle E. Simmers, M.D., FAAP is board-certified by the American Board of Peditrics, and has been practicing at White-Wilson Medical Center in Niceville, FL since 2004. Dr. Simmers received his medical doctor degree from the Medical College of Georgia in Augusta, GA. Upon graduating, he went on to complete his internship and residency training in Pediatrics at Keesler AFB Medical Center in Biloxi, MS. Dr. Simmers served as a pediatrician at the 96th MDG/Eglin Air Force Base Hospital at Eglin Air Force Base before joining the White-Wilson Pediatrics Clinic in Niceville. Dr. Simmers specializes in wellness childcare; acute childcare; immunizations; preventive medicine; chronic illnesses and sports physicals for infants, children and adolescents under the age of 18.